Monet’s Table has been a major fund raising event for North Tahoe Arts. Artists and community members donate all types of art for this sale. 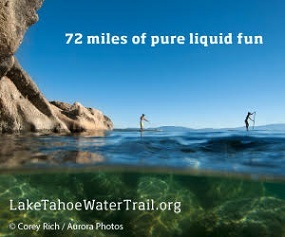 All proceeds benefit North Tahoe Arts, which relies on fundraisers and contributions to operate its art center. North Tahoe Arts is a 501(c)(3) nonprofit corporation supporting opportunities to view and participate in art and culture activities. It fosters interactions with artists and educational classes. North Tahoe Arts operates the art center at 380 North Lake Blvd. in Tahoe City, just above Commons Beach. The programs of this non profit include monthly exhibits in the two galleries, local children’s exhibits, artisan shop (which helps to raise funds for the organization), kids art camp, Art in Public Places, North Tahoe Plein Air, Tahoe ARTour, A Gathering of Art, art classes, kids art Saturdays, book signing, poetry reading, and other kids art events like Paint the Bear during Snowfest. Many of these are offered free of charge to the community or for a small donation. 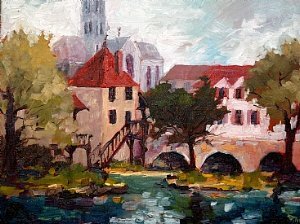 Image credited: Andy Skaff “Moret-sur-Loing” local artist and member of NTAC.